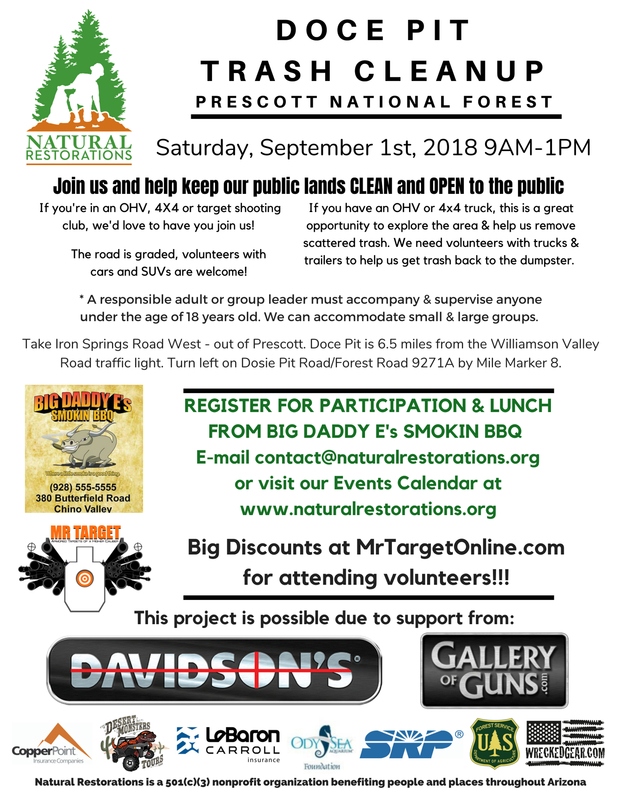 Join us Saturday, September 1st from 9AM to 1PM for our first Prescott Cleanup at Doce Pit. Help us keep our public lands CLEAN & OPEN to the public. The Doce Pit area is in the Prescott National Forest. BIG DISCOUNTS at Mr Target for attending volunteers!!! This project is possible due to support from: Davidson’s Inc. in Prescott, Gallery of Guns, Big Daddy E’s BBQ and catering in Chino Valley, CopperPoint Insurance Companies, Desert Monsters Tours, LeBaron & Carroll Insurance, Mr Target Online, OdySea Aquarium Foundation, Salt River Project, everyone at the U.S. Forest Service – Prescott National Forest, and Wrecked Gear. We cannot thank them enough for their help and support!